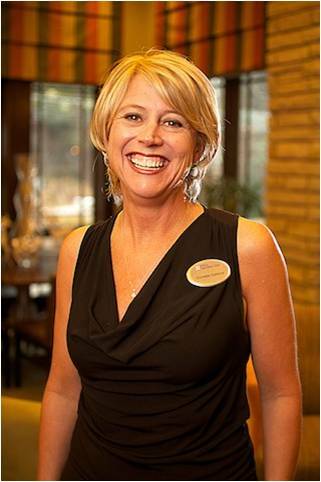 GATLINBURG, TENNESSEE, January 12, 2015 – Hospitality Solutions, Inc., a Gatlinburg based hotel management company, and the Hilton Garden Inn Gatlinburg are proud to announce that Cornelia Dobbins, the hotel’s General Manager, was selected for the Barbara Bejan General Manager of the Year for 2014 for the entire Hilton Garden Inn Brand worldwide. Hilton Garden Inn Brand is comprised of over 600 hotels in 19 countries. Cornelia accepted the award at a ceremony January 11th at the Hilton Garden Inn brand conference in Orlando. She was presented the award on stage from Jim Holthouser, Executive Vice President Global Brands, Hilton Worldwide and Adrian Kurre, Global Head Hilton Garden Inn to a standing ovation from the 2,000 brand attendees and Hilton Worldwide community. The award places Cornelia as the top leader selected from 600 hotels worldwide. This award is presented to the General Manager of an exceptional hotel that demonstrates ultimate leadership in all areas of the hotel, outstanding personal performance as well as going above and beyond brand expectations. Specifically, her award included examples of excellence in revenue strategies and production, market performance, service delivery, and overall guest satisfaction. Cornelia has volunteered her time on brand related programs, including as a member of the General Manager Advisory Council. In addition; prior to winning the award Cornelia was asked to represent the brand as a presenter for a Hotel Management webinar on “Advancing Your Green Profile”. Her leadership is evident in the community where she serves on several boards; including the Gatlinburg Visitor and Conventions Bureau and the Gatlinburg Hospitality Association. Furthermore, she and her hotel team volunteer time for several non-profit organizations and events within her community. Cornelia’s biggest success is her ability to balance work and family life. She and her husband, Scott, have three beautiful children—Jace, Justin and Jada. Her example of complete life balance: work excellence, community and brand involvement and leadership, and fulfilling family life place her at the top of the brand and industry.